How many times have you heard a beauty product being called ‘a miracle must-have’? I’m probably guilty of saying it myself sometimes. If it comes from a beauty influencer, I’m inclined to believe them over a brand promising to fix all of your problems in one simple product.However, what if I told you about a miracle must-have that actually does do the job? You may not believe me, but bear with me – it’s a good one. My skin is dry, flaky and looks dull. Not everyone has time to exfoliate and even despite your best efforts, external factors can dry out your face and make you forget you put moisturiser on in the morning. Dry skin is miserable, but it can be fixed. Let me let you in on a bad habit of mine. I squeeze the gunk out of my nose pores. Yep. Big beauty no-no. The only side effect that I get from this is a ridiculously flakey nose that won’t go away. Until now. Pixi Overnight Glow is the exfoliating miracle worker that works overnight to get rid of the dead skin cells. When you wake up in the morning, your skin feels super soft and glowing – like you’ve had a peel or something. I don’t have to scrub away at the contours of my nose as nothing is there – big time saver. 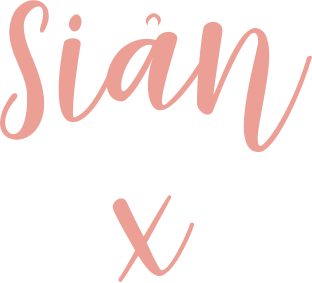 I most recently featured it in my beauty tips for brides post as something you should be using. Pixi Overnight Glow contains 10% glycolic acid and arginine – natural ingredients that help to improve the appearance of your skin. 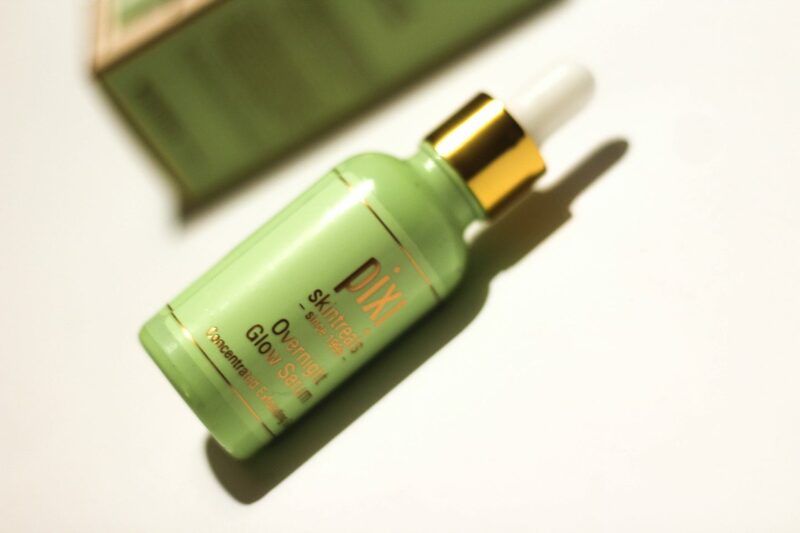 If you’ve used Pixi Glow Tonic, you’ll know that this contains 5% glycolic acid. This helps to reduce flaky skin, which is great, but if you’re the wrong side of your 20s like me (oh wait, I turned 30 last year…), then it will also help reduce fine lines and wrinkles – big bonus if you’re a Botox-phobe like me. Shouldn’t something this harsh-sounding leaving you red faced and sore in the morning? Nope. The serum contains aloe vera, cucumber and vitamins A, C and E that calm irritation and leave your skin feeling nourished. 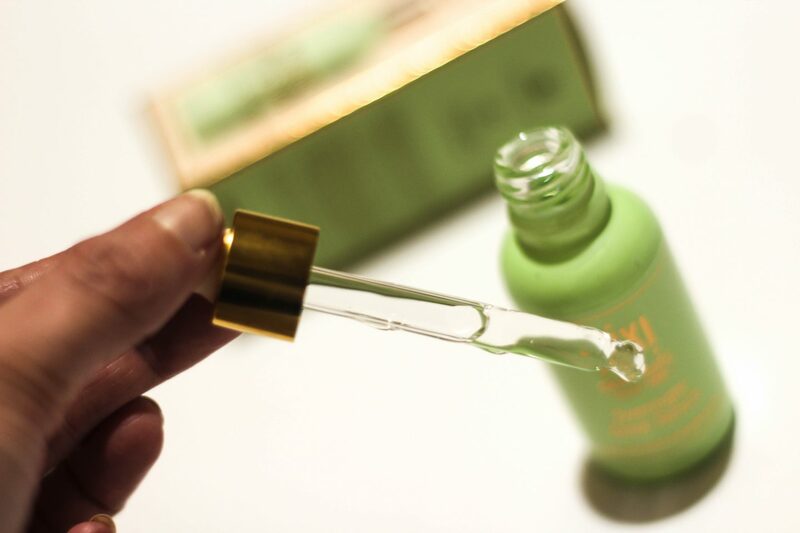 Pixi Overnight Glow Serum is super easy to apply. Cleanse and tone your skin first, removing all makeup and making sure your skin is clean. As with most good things, it comes with a handy dropper. Apply 2-3 drops to your fingers and massage into your skin. Follow with moisturiser. I’m going to tell you the truth here. My normally tough skin stung a bit the first time. Not enough for me to freak out, and only some parts of my face. I must have had a spot on my forehead I hadn’t noticed because there was one bit that was particularly painful. My cheekbones felt tighter (in a good way) and there wasn’t much of a scent with it. However, it didn’t last long and I knew my moisturiser was doing it’s job. I woke up in the morning with skin that really did glow. It felt soft, but not in a greasy way – it was clean and beautifully smooth to touch. I only needed my usual cleanser and toner in the morning, followed by moisturiser – no face scrub in sight. Pixi Overnight Glow is now a firm part of my makeup routine. My skin looks refreshed and younger and I do feel like the lines on my forehead are less visible. I would recommend using it twice a week and no more, especially if you have sensitive skin. Pixi recommend using SPF after using, which is definitely good advice – Sun damage will undo all of your hard work. This is a great product for women and men – we all want smooth skin, yes? Guys, I wouldn’t recommend using it after shaving but certainly give it a try as part of your skincare routine. 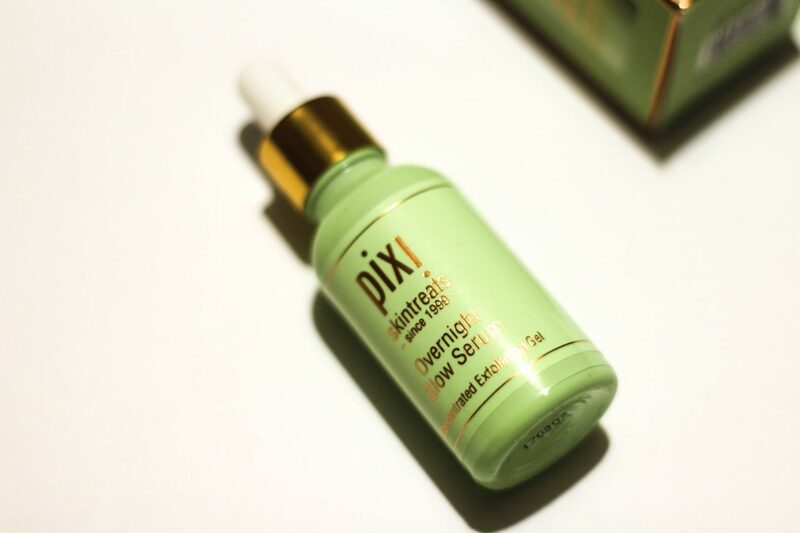 Don’t get me wrong, at £26 – Pixi Overnight Glow Serum is a bit of a pricey product. But it will last ages. They sell it on Look Fantastic, ASOS, Marks and Spencer and other stores who regularly offer 20% off so you can wait and get it for £20.80. Good skincare costs money and this is actually much more affordable than similar products available on the market. 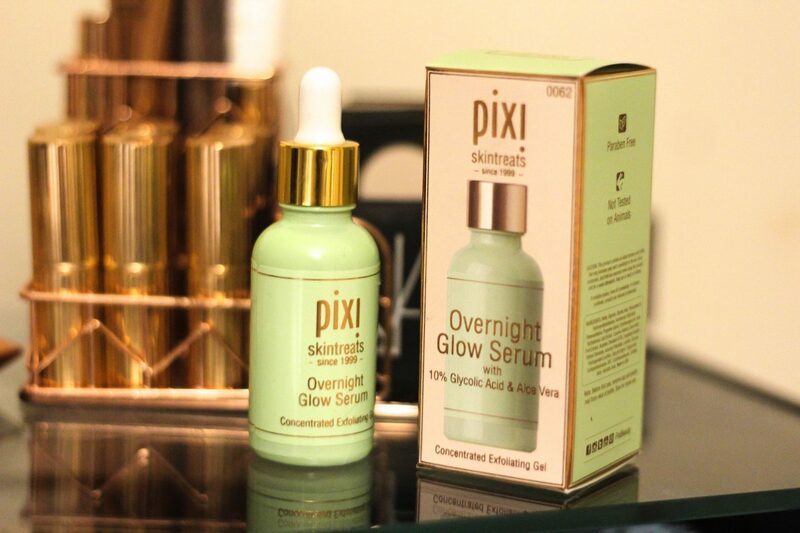 As my latest miracle must-have, give Pixi Overnight Glow a try. Is dry skin a problem for you? What do you do to keep it under control? I’d love to here your thoughts below! LOVE the sound of this, I’ve yet to try any of the Pixi range – late to the party I know, I tend to use Alpha-H as a similar product but will definitely give this one further investigation! Pixie is a brand I want to try more and more of. I simply can’t get enough of them! Looks like it’s perfect for my dry skin. Pixi is definitely the brand I want to try more, they seems to have many amazing stuff. I love the sound of this, I’m yet to try any pixi products but I’ve got a long list of ones I do want to try. This is definitely going on it, as much as I try to do exfoliators time is just not something I have so this sounds super easy to bring in to my skincare routine. This sounds so good! I’ve only tried pixi glow tonic so far from pixi and I’m not sure how I feel about it but I love the sound of this! Although I just recently picked up the kheils midnight recovery oil and I love that.